Leaders inTraining (LIT) is a summer apprenticeship and free enrichment program for local teens. It has taken place at Eden Place Nature Center every summer since its founding in 2009, with the support of past partners such as the U.S. Forest Service International Programs, Bank of America, and Building Bridges to the Outdoors, a joint project of the Sierra Club and The Sierra Club Foundation. Read below for more information about the program, and check back soon for applications and details for LIT 2015! 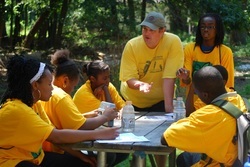 Participants learn about and engage in nature recreation activities (such as camping, hiking, and fishing) and community service projects related to nature conservation in the Fuller Park neighborhood. 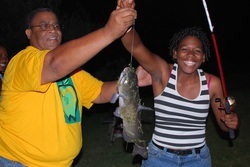 The program cultivates environmental stewardship, an appreciation for nature, and a willingness to give back to the community through nature-based service projects. In particular, we focus on preserving habitat for and providing education about the monarch butterfly because Eden Place is the official Illinois location of the international MonarchLIVE program. Past LIT seasons have featured camping trips such as an overnight trip to Midewin National Tallgrass Prairie in Wilmington, IL; a two-night camping trip to the Illinois State Fair in Springfield, IL; and a four-night camping trip to Starved Rock State Park, IL. Participants learn about urban agriculture, horticulture, organic gardening, and entrepreneurship as they engage in hands-on work at Eden Place Farms, the urban agriculture program hosted by Eden Place Nature Center (a subsidiary of Fuller Park Community Development). 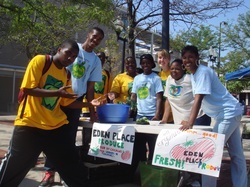 The Leaders in Training will gain skills in leadership, interacting with the public, managing funds, developing a business plan, and more as they help grow organic produce and sell the produce at the Eden Place Farmers Market every Saturday. Through field trips and interactions with guest speakers, participants learn about career opportunities in fields related to environmental work such as green energy, forest stewardship, nature conservation, scientific research, agriculture, and more. The summer training program is meant to spark the interest and provide a foundation for youth to consider careers in environmental fields, and the Leaders in Training will interact with professionals and practitioners ready to share their expertise.